Having made ourselves at home we were in a position to search out the locality, meaning a walk to the nearby seafront village of Locquirec. Not wanting to be entirely a slave to technology I have renderd this attractive portrait from the vantage point of our beachside campsite across the bay, a more creative take on the current penchant for the ‘foot selfie’ I’m sure you’ll agree. More in keeping with something that might have been produced by Keats or Byron on their Italian tour . . . I’ll stop now, before the fantasy veers off into outer space! Anyway, back to the original story. We offed to the village en pied for a change and, what a piece of luck . . . it was market day. 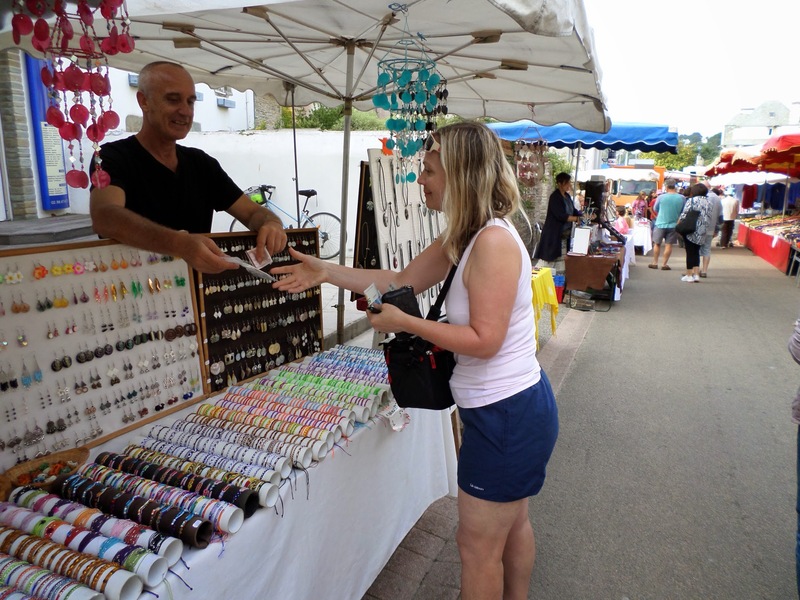 Now, regular readers will know of S’s penchant for market tat, and true to form she spotted several urgent purchases amongst the extensive stalls. . . but we were on holiday, so one must make concessions. It was shortly after this that Realisation dawned: I had been here before, with the SBCC in fact, on that very windy day two years ago when we decide to make a second attempt at a trip to the seaside after aborting the first in the teeth of a typhoon. On that day, however, the place was deserted and we luncheoned on a baguette and Breton Far flan seated on the harbourside . . . but that is another story which I have previously related. 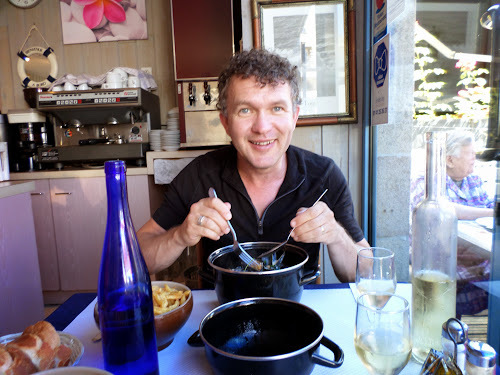 After having seen the sites we returned to the campsite to drop off the purchases and check out a seafood restaraunt nearby. Unfortunately, this proved to be a place with tablecloths (i.e. 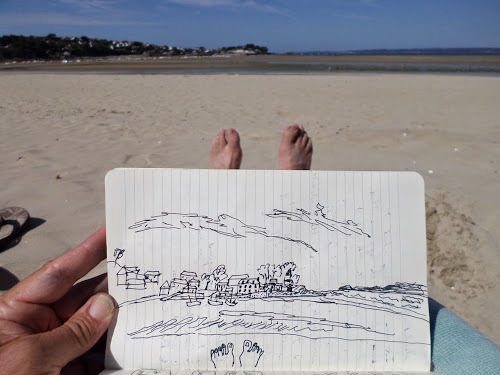 pricey) so we returned the two miles to the village where the first, much earned, moules et frites of the holiday was consumed – the afternoon was spent sleeping it off on the beach. Tonight is the first campsite curry of the trip and tomorrow we cycle along the coastal route to our next location where I expect the usual duel with the booking clerk . . .